Food is vital for our brains! Food (along with water, rest, and warmth in Maslow’s Hierarchy), is a necessity for survival. We are conditioned to learn the importance of food from birth. Throughout our lives we learn about vitamins, minerals, carbohydrates, proteins, and fats – the ingredients our bodies need to function. Many of us are able to notice the physical effects of our diet, such as energy, sluggishness, sleepiness, or weight loss or gain. 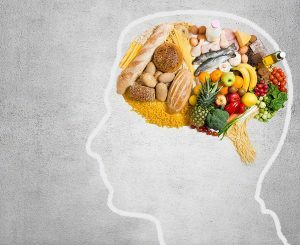 Diet, not surprisingly, also has significant effects on our brains. Preferences for types of food can begin in the womb as a pregnant mother nourishes herself.Studies show that if moms drink carrot juice during pregnancy, infants are more likely to prefer the flavor of carrots. This theory was also tested with monkeys who were fed either high-fat or low-fat diets when they were pregnant. To see how mothers’ prenatal diet had changed the offspring’s brains and possibly permanently sculpted their food preferences, the researchers looked at the expression of dopamine markers in the brain. In the monkeys, prenatal diets high in fat led to a decrease in the number of dopamine fibers and a decrease in dopamine receptors, possibly explaining why the toddler monkeys gorged on sugary, fatty food: they had to eat more to feel the same pleasure. These findings suggest their brains were primed early on in development to want more junk food. A not-so-healthy ingredient known to strongly affect the brain, present in many foods today, is high fructose corn syrup. We can tout the many ill effects of this ingredient, but more universally important is the overall effect on the brain for all types of processed sugar. Sugar has been proven to increase levels of stress hormones in the brain. As adolescence is a time when many are consuming several foods with sugar, as well as a crucial time for brain development, high sugar consumption and the subsequent increase in stress hormones during this time can trigger mental health problems, like anxiety and depression. Further, the onset of obesity profoundly affects overall health, and of course, brain functioning, specifically in the hippocampus. Spinach: Popeye was onto something when he slammed that spinach. However, aside from building lean muscle, this particular leafy green is touted with slowing cognitive decline associated with aging and the risk of developing Alzheimer’s disease. Eggs: Eggs are considered a super food – the whites are protein rich while the yolks contain a precious water-soluble nutrient called choline, which improves memory, focus, and overall cognitive performance. Red Meat: I know you’re used to hearing all the reasons why not to eat red meat. Well here’s a convincing reason to dig into a nice, lean piece of steak-iron! Studies show that healthy levels of iron improve mental function; while iron deficiency blocks oxygen flow through the body and brain, causing mental fatigue. Walnuts: You probably already guessed that walnuts are a rich source of omega-3 fatty acids (healthy fat), but did you know that they’re also extremely high in antioxidants, which promote brain function? So sprinkle them on salads, your morning cereal, or grab a handful for a brain-boosting crunch. Yerba Mate Tea: You already know that herbal tea promotes energy, weight loss, and so much more. Well a certain brew, yerba mate, will also curb your mid-afternoon slump. The South American tea leaves cause a similar energizing affect on the brain to caffeine, but don’t follow the spike in energy with burn out. Lentils: Red, orange, green, and brown, this colorful legume is super rich in folate, a type of B vitamin that enhances brain power and increases the dopamine function within the brain, to boost both performance and mood. Beets: Roast them, pickle them, bake them – whatever you do with beets when you eat them, you’re getting a blast of genius to your brain in the form of natural nitrates. This root veggie actually encourages fresh blood flow to the brain, which in turn, boosts mental performance. Oats: Cookies, energy bars, muffins, oatmeal! The body and brain love this healthful source of glucose more than any other. That’s why food scientists recommend oatmeal for breakfast to fill you up and keep your body and brain powered all morning long. Sardines: This little fishy is jam-packed with EPA and DHA, two types of omega-3 fatty acids that help you focus thanks to boosting brain cells and neurotransmitters. If you’re not fussy on fish, try taking a daily fish oil capsule instead. Flax: Sprinkle a few teaspoons of flax seed or flax oil in your morning smoothie or breakfast cereal to get a healthy dose of alpha-linolenic acid (or ALA) fat. Not only will you boost the performance of your cerebral cortex, the area of the brain that registers touch and taste; it also repairs damage or stress to brain and nerve tissue. So, take this food for thought and keep it in mind next time you head to the kitchen! This entry was posted on Tuesday, July 11th, 2017 at 2:55 pm. Both comments and pings are currently closed.